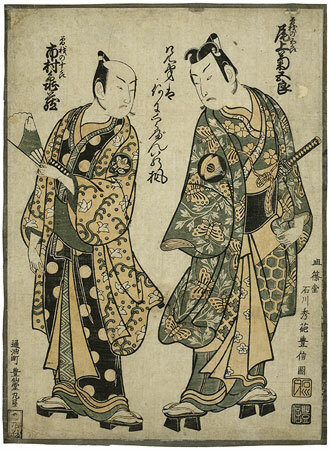 Like so many of the splendid large two-colour prints designed by Toyonobu in the 1750s this print seems to be unique. An elder and a younger brother? The brothers, of course, are the Soga brothers, and the poem may be saying that we can no more compare the two than we can compare the cherry blossom of spring with the maple leaves of fall. Hanakaede is a particular form of maple tree, but the word easily divides into “flower” (hana), that is to say cherry blossoms, and “maple” (kaede).